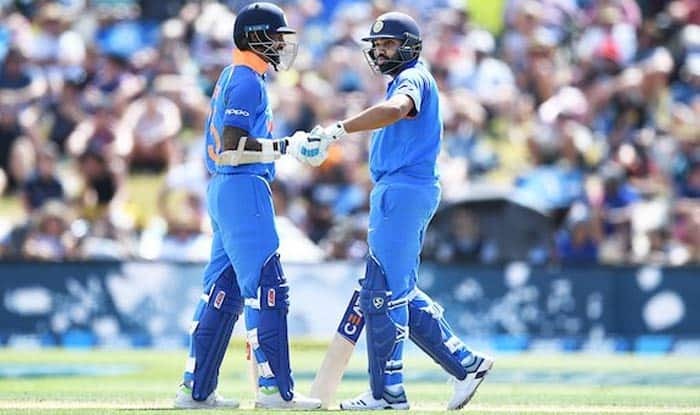 1st T20I India vs New Zealand: Another massive milestone beckons India openers, Shikhar Dhawan and Rohit Sharma. 1st T20I India vs New Zealand: Another massive milestone beckons India openers, Shikhar Dhawan and Rohit Sharma. The opening duo is 25 runs away from surpassing former opening pair of Virender Sehwag and Gautam Gambhir to become the most successful pair for India in T20Is in SENA countries. Dhawan-Sharma is on 357 runs whereas Sehwag and Gambhir have 382 runs. The two pairs are followed by the pair of Kohli-Raina, Sharma-Kohli, and Sharma-Gambhir. Here is the list of the most successful pairs in T20Is for India in SENA countries. Meanwhile, India stand-in captain Rohit Sharma is on the verge of two massive world records. He has the chance of becoming the leading run-getter in T20I cricket. He needs 36 runs to go past Martin Guptill. The Indian captain could also join Guptill and Chris Gayle to become the third cricketer to hit 100 sixes in T20I cricket. Gayle and Guptill have hit 103 sixes, whereas Rohit has 98 to his name. Rohit will also have a chance to take over Virat Kohli in the list of most wins as captains in the shortest format of the game. The Men in Blue will hope their captain sets the tone with the bat and lead from the front like he always has. He has led India in 12 T20Is and just lost one. India had earlier defeated the Kiwis 4-1 in the recently concluded five-match ODI series. They will look to carry the momentum into the upcoming three-match T20I series.